What’s your favorite parent-child relationship in pop culture? Hey A.V. Club, what’s your favorite parent-child relationship in pop culture? Good, bad, or whatever. I always had a soft spot for Dr. Katz and his son, Ben. They really had a genuine closeness and friendship you don’t often see. For a short time after my parents’ divorce, when I was around 9 or 10, I lived with my grandparents. Understandably, I felt weird about the change. But I found solace in the parent-child relationship between Arnold and his grandparents on Nickelodeon’s Hey Arnold! The immediate parallels offered instant comfort, allowing me to relate to what otherwise might seem like an unusual experience, and as the series progressed, I found further comfort in how influential this relationship was for Arnold. He gains a certain wisdom from listening to his Grandpa Phil’s (sometimes ridiculous, but sometimes dead-on) advice and an unflinching quest for justice from watching his Grandma Gertrude’s many political antics, which allow him to be an understanding and solution-oriented kid. I like to think I also gleaned a few things from my grandparents during that time, like my Grandpa Alex’s love for writing (after seeing him publish a book), or my Grandma Annie’s attention to detail (stemming from watching her plant intricate gardens). Most importantly, I learned a different family configuration is nothing to be anxious about. The ad wizards at Netflix knew exactly how to get the Gilmore Girls fan base onboard with the show’s upcoming streaming sequel: Show off some familiar Stars Hollow landmarks, deploy the most evocative cue in Sam Phillips’ arsenal of strums and “la”s, and then cut straight to the Gilmore yakking. Banter is the key to Lorelai and Rory Gilmore’s appeal as television characters, but the strength of their relationship goes beyond verbal rat-a-tat and encyclopedic pop-culture knowledge. It’s in their fierce loyalty to one another, and how that loyalty, protectiveness, and closeness (in age as well as familial connection) fuels heartwarming and heartbreaking moments alike. The Gilmores are an ingeniously versatile pair, as at home in a friendship story as they are in a mother-and-daughter story, with one dynamic always bleeding into and informing the other. And on top of that, Lorelai’s motivation for raising Rory the way she does—differently from Gilmore matriarch Emily, played to persnickety perfection by Kelly Bishop—meant that Gilmore Girls always had another compelling parent-child relationship waiting in the wings. But Emily and Lorelai could never riff on TV reruns and alt-rock favorites over a plate of Pop-Tarts quite like Lorelai and Rory can. Lately I’ve been thinking a lot about what kind of relationship I want to have with my twin daughters, mostly as a daydreaming distraction from the fact that they’re currently very small, babbling, occasionally barfing creatures. But whenever they finally grow out of this awkward, 14-month-to-15-year-old transitional phase, we could certainly do a lot worse than have the kind of bond Veronica Mars has with her dad, Keith. Much like Gilmore Girls’ Lorelai and Rory, Veronica and Keith’s rapport is steeped in a lot of sassy quipping that masks an intense loyalty—so loyal that Veronica stood by her dad even as it made them both social pariahs. Naturally, that’s something that appeals to me, given my innate difficulties with getting mushily sentimental. But behind all their gentle ribbing and occasional parental and professional clashes, what really makes Keith and Veronica’s bond special is the respect they have for each other: Even as Veronica is out there every night doing dangerous detective work (or, more dangerously, living as a teenager), Keith always trusts she has the wisdom to do the right thing, while he’s the first person Veronica turns to when she doesn’t know what that is. Someday I hope to fill that same role for my own smart, fiercely independent girls. Not least because, by the time they’re Veronica’s age, I’ll be in my mid-50s, and too tired to do much more than banter. The 1988 film Running On Empty has a lot to recommend it: a compelling plot, a prominently featured James Taylor song, and a weeping teenaged River Phoenix (seriously, he’s right up there with Claire Danes for young actors I most enjoy seeing cry). It also features a complicated, beautifully rendered parent-child relationship between Phoenix and Christine Lahti and Judd Hirsch. The family, including a younger brother, has been on the run from the FBI ever since the anti-war parents bombed a napalm factory, accidentally blinding and paralyzing a janitor, when Danny (Phoenix) was 2. What’s most striking about the relationship is how Danny’s parents treat him like an equal—and not just because they ask him to be complicit in their crime by lying about their background. Rather, it’s in the way they talk through their very real, high-stakes problems and how, by film’s end, they respect Danny enough to let him go, allowing him the very adult freedom to pursue his own life. If there is any parent-child relationship of which I am actually jealous in popular culture, it is that of Paula and Brendon Small on Home Movies. These two set a new standard for excellence in mother-son candor. They can talk to each other like people, almost like peers, in a way that most parents and kids cannot. Paula, who is still working through the anxieties and insecurities of childhood, is often flustered and overmatched as the mother of two young children, especially when one of those children is as unfocused and id-driven as Brendon. She knows she has to tell Brendon to buckle down in school and take life more seriously, but she knows he will never follow through. And I doubt she’d really want him to. She’s just as baffled by the arbitrary unfairness of the adult world as he is. Special props here to actress Janine Ditullio, who inherited a role that was written for and named after Paula Poundstone but nevertheless made it her own. Pretty much any combination of parent and child on The Simpsons is pretty great, but it’s no coincidence that some of the show’s strongest emotional moments (see “Lisa’s Substitute,” “Lisa’s Wedding,” and “Lisa The Vegetarian,” among others) and biggest laughs (“Lisa, I want to buy your rock”) come from the differences and reconciliations between Homer and Lisa. 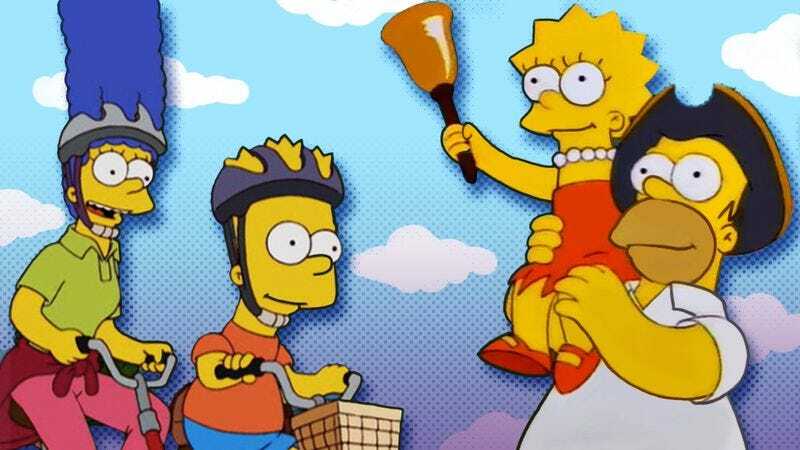 A smartass kid and a bumbling parent is a stock sitcom combination, but The Simpsons gives us the sweeter, more nuanced version of that dynamic, where young Lisa is undeniably gifted, and sometimes has trouble relating to her undeniably dimwitted, sometimes boorish father. It’s a lovely, ongoing exploration of how to bridge enormous gaps in understanding that can form between flesh and blood. I plan on revisiting these episodes just as soon as it becomes clear how much smarter my 11-month-old daughter is than I am. I’m going to go with The Simpsons’ other parent-child counterpart (sorry, Maggie): Marge and Bart. As the mother of my own “special little guy,” I get why Bart compulsively wants to torture Principal Skinner or make crank calls to local establishments. It’s the same reason my son wound up with four soccer balls on the roof of his elementary school last year, because doing it once somehow just wasn’t enough. But even Bart has lines he knows that he should not cross, which is why “Marge Be Not Proud” is my all-time favorite Simpsons episode. Bart shoplifts the new Bonestorm video game, for once getting on Marge’s absolute bad side, and has to make amends to win her back. Marge is devastated because, like me, even after all of his hijinks, she believes her kid is good at heart. She is fortunately proven right with Bart’s perfect gift to her at the end of the episode. It’s a reminder that “mischievous” and “evil” aren’t the same thing, even as we say goodbye to yet another soccer ball. I suppose it’s appropriate for me to give the most dad answer imaginable and highlight something I never would have considered before becoming a parent myself. I am unhealthily obsessed with Sesame Street, and while a lot of people find Elmo annoying, I find the little red dude endlessly charming. No part of his blessed existence pleases me more than Elmo’s relationship with his dad, Louie. Louie is a stay-at-home dad, and, it would seem, Elmo’s primary caretaker. Their relationship is characterized by enormous sweetness, affection, and tenderness. They clearly adore each other, and I would be lying if I said I didn’t aspire to be as good a dad to my boy as Louie is to his son. Louie is a bit of a hepcat, a goateed jazz musician who teaches his son about life, often using music and movement. That’s the case in “Potty Time,” where Louie uses a down-and-dirty blues number to encourage Elmo in his potty-training endeavors. It’s a song I may or may not know by heart, and I am not ashamed of that fact. For myself, the most indelible parent dynamic remains the father-son duo of Ittō and Daigorō Ogami, better known as Lone Wolf And Cub. Mostly because Kazuo Koike and Goseki Kojima’s manga about the wandering assassin remains one of the best comics made. It’s gorgeously drawn, with a languid, philosophical tone seemingly at odds with a story about a man who pushes his 3-year-old child around in a baby cart outfitted with assorted hidden death-dealing instruments. But also, the relationship between the two is the core of the story. Even though Ogami’s pursuit of revenge places him on an unbending trajectory toward ruin and self-negation, it doesn’t negate the love he has for his son. It’s a clever subversion on the archetype of the lone wanderer; pairing a character usually presented as an unstoppable force of singular purpose with something as vulnerable as a child. Sure, it’s the kind of story where a dying man admires the technique of sword stroke that causes a whistling noise as the blood jets from the wound, but it’s also the story of a doomed man who travels the length of Japan to find oranges for his sick son. Familial relationships don’t have to be good to shed light on their members. Just take a look at the heroic Elan and his villainous dad, Tarquin, in Rich Burlew’s long-running web comic The Order Of The Stick. On the surface, father and son couldn’t be more different—Elan is good but dumb, while his dad is the cunning, mass-murderous ruler of a cruel empire. But both share a deep belief in the power of stories, relying on the logic of narrative to guide them to their proper roles in Burlew’s fantasy world. When Tarquin lays it out in an epic speech that nearly breaks his son—promising him that their conflict will make them both legends, whose violent cycle will be imitated for generations—it’s the kind of harsh reflection of Elan’s worldview that you can only get when family members go head to head. It’s only Elan’s willingness to admit he’s fine being the comic relief sidekick, not the hero, that lets him grow as a person and triumph over the man he could have been. I have Star Trek on the brain this week thanks to the 50th anniversary (okay, let’s be honest, I regularly have Star Trek on the brain for no damn good reason), but I think my answer holds up regardless: Benjamin and Jake Sisko from Deep Space Nine. Making a father-son relationship one of the central pieces of the show’s ensemble could’ve been disastrous, but it turned into one of the series’ great secret strengths, both in episodes that brought their bond to the forefront (I don’t think I’ll ever be able to watch “The Visitor” without crying), and ones that just let it sit in the background as an essential part of both characters’ lives. The drama between them was kept largely to a minimum—Ben Sisko, whatever trials he faced, was a good dad, and Jake was a good son, even if he didn’t always agree with what his father wanted. The simplicity of that still gets to me. It meant that no matter how strange the series got, there was always something comforting and real to come back to. I love Jane The Virgin for many reasons, but especially because of the multigenerational matriarchy at the heart of it. Alba, Xiomara, and Jane Villanueva certainly don’t have perfect relationships all the time, but they’re a radiant and relatable grandmother-mother-daughter trio that fuels the warmth and intimacy of Jane The Virgin’s family drama. Even when there’s friction between Alba and Xo or between Xo and Jane, the relationship dynamics of these three strong women is far more captivating than any of the romantic storylines on the show (though those are great, too). Xiomara and Jane have totally different personalities but are indelibly bonded, and that simultaneous closeness and distinction is true of Alba and Xiomara, too. The relationships between the three explore generational divides in immigrant families in a way that speaks to me and my experiences with my Indian father and grandparents. And scenes between the three are almost always guaranteed to make me cry (or, in the case of the time Xo and Alba accidentally got high, laugh uncontrollably). In a show fairly aglow with the light of faith in those you love, no relationship is more warming than that of Daniel Holden and his mother Janet on Rectify. During Daniel’s decades on death row for a horrific crime whose true details remain cloudy, J. Smith-Cameron’s Janet has been widowed, remarried, had another child, and managed the steamroller anger of daughter Amantha (Abigail Spencer), all while maintaining stalwart faith in both her son’s innocence and the idea that he’ll return to her somehow. The thing is, when the deeply damaged Daniel (the astounding Aden Young) is provisionally released back into her life, Janet’s prim maternal love runs up against a host of unexplored issues and dilemmas. But, in keeping with Rectify’s character as the most deeply human show on television, Janet’s stalwart faith in her son forms the backbone of the series, just as it has done for her fractured family. Fittingly, the third season finale sees mother and son on a road trip to Daniel’s new home-in-exile, the bittersweet culmination of their long-delayed love story, and it’s transcendent. A lot of my favorites have been called out here already, and while I thought about contributing another of the wonderful and endearing examples of healthy and loving parent-child duos in pop culture—Easy A’s Olive Penderghast (Emma Stone) and her parents (Patricia Clarkson and Stanley Tucci) being a particular favorite—I decided to go the opposite route. Bates Motel’s Norma and Norman Bates are utterly codependent, deeply devoted to one another, and one of the most riveting mother-son relationships I’ve ever seen, anywhere. A lot of this is probably due to the actors, especially Vera Farmiga, whose smothering example of maternal love is one of the most exciting and live-wire performances on television. But it’s also the adept way the show (even at its most gloriously over-the-top) threads the needle of an association both toxic and supportive, loyal and corrupted, with just the right dose of camp. I wouldn’t recommend them as a model for proper family dynamics, but God, are they great to watch. I go to the Arrested Development well a lot for AVQ&A. Nothing that’s enjoyed such a permanent, dedicated position in my Netflix “recently watched” queue—and before that, in my DVD player—could fail to supply easy answers to these weekly pop-culture surveys. At the risk of repeating myself, I’ll cite the sitcom yet again by noting that one of the reasons I fell in love with it in the first place was the hilarious, heartbreaking, always-complicated relationship between put-upon Michael (Jason Bateman) and his neurotic son, George Michael (Michael Cera). Michael spends most of Arrested Development’s run lamenting the selfishness of his family, but the way he constantly fails his own kid—pushing him too hard, interfering in his love life, overlooking his needs—mark him as a Bluth through and through. Some of my favorite gags from the series revolve around the tension between the two, from Mr. Manager to every crack at Ann’s expense. But Michael genuinely wants to be a better father, and that battle between his good intentions and his more self-serving instincts provides the show with its comedic and emotional center. Not coincidentally, it’s also the best thing about the wildly uneven fourth season, which ends on a father-son moment that was a long, long way coming.